Now we are going to prepare a “cooking base". That’s how the stocks are called that are prepared with a concentrated flavor, that serve to enrich and give a better flavor to dishes like: soups, creams, salsas , rices, etc. The fish stock recipe is very important for the vast majority of soups that have fish or shellfish as main ingredient. Since the secret of these soups largely depends on the stock , to such a degree that the success or failure of the soup relies in the stock not that much in the soup preparation. – For this reason it is very important that the fish stock has an intense flavor but at the same time it lends to combinations and mixtures. Although that won’t be a problem because with this recipe you will cook a phenomenal fish stock. With this base many dishes can be prepared such as: fish soup, seafood soup , paella, rice , etc. Making this recipe is the simplest thing that there is, only some ingredients have to be chopped and then everything is cooked in a saucepan and presto. If you have some fish pieces that don’t serve you now is the moment to use them, instead of trashing them. In this recipe even fish bones can be used but don’t use viscera nor scales because they will bitter the broth. The recipe is given with pore because it gives more flavor to the stock. If you don’t find it 1/2 onion can also be used. This recipe is for about 3 qts of stock. Cut into chunks the carrots that were peeled and 2 celery stalks. Upon completion put these ingredients in a saucepan and reserve. Rinse 2.2 lbs of fish leftovers and put them in the saucepan with the other ingredients. When it boils reduce to medium heat and leave the broth cooking for 20 minutes. It is very important not to cook the fish stock for a longer time because its flavor will turn bitter. If scum accumulates on the surface remove it. Remove from the fish stock, with a kitchen spoon the ingredients that were cooked. Strain over a food container the fish stock. * If the stock is refrigerated it will last about 3 days and if it is frozen about 3 months. 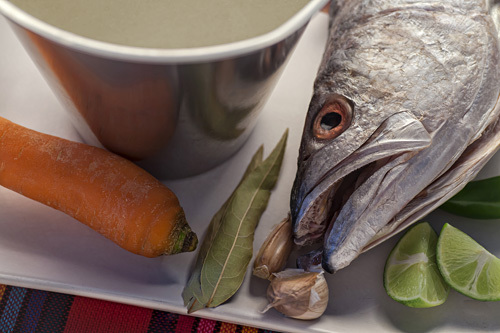 Tip: If you want to use the vegetables that were used to prepare the broth, we only recommend using them in dishes with fish due to the flavor that they acquire. Variation: Stocks with elaborated flavors: beef stock and pork stock. Did you like the Fish Stock? If you don’t have peppercorns buy the Simply Organic which is characterized for its freshness and organic quality.